Two sixth-graders from Calgary are heading to Seattle to take on big coffee. Mya Chau and Eve Helman launched a petition to demand Starbucks create a fully recyclable coffee cup. Two sixth-graders from Calgary are heading to Seattle to take on big coffee. 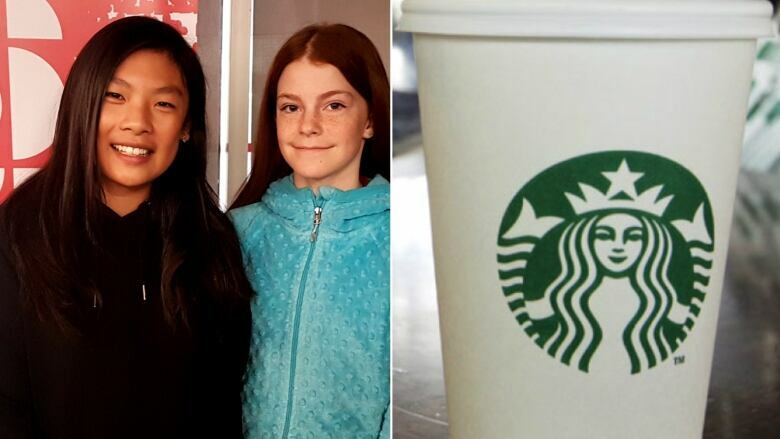 For their science fair project this winter, 12-year-old Mya Chau and 11-year-old Eve Helman launched a petition to demand Starbucks create a fully recyclable coffee cup. By Monday, their petition had garnered almost 300,000 signatures on Change.org. The popularity of their petition caught the attention of a coalition of environmental groups, including Greenpeace, that has been pushing for such a change for years now. The groups have pitched in to send the two girls to Washington state on Tuesday. "We're going to try to attend the Starbucks shareholders meeting and hand in our petition so they will try to get a fully recyclable cup everywhere," Eve told the Calgary Eyeopener on Monday. Coffee cups: Are they being recycled at Tim Hortons and Starbucks? The girls aren't yet sure they'll be allowed to attend but hope their message hits the right ears. They're hoping Starbucks will say "they want to change to help the environment," Mya said. The two became interested in the issue of coffee cup waste about two years ago. "I heard my mom talking about how bad they were for the environment and I thought, 'Wow, they're so bad, like the ocean can get filled with garbage and stuff," Mya said. "And then me and Eve thought we should survey people." 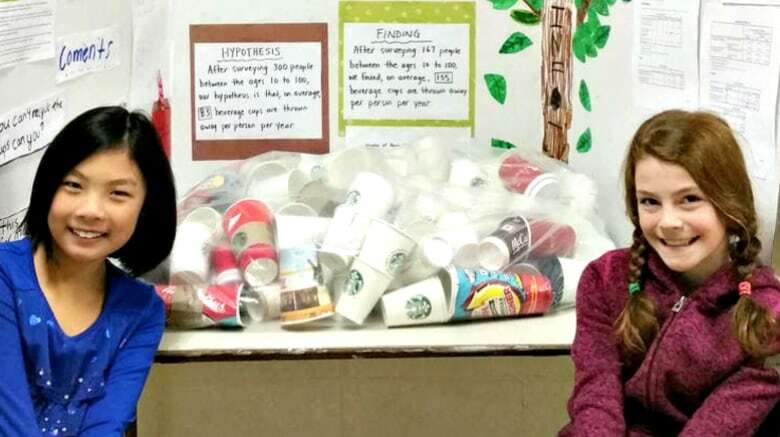 For their fourth grade science fair project, they surveyed 167 people at schools and malls and found that on average, each threw out 155 coffee cups a year. The environmental groups say Starbucks promised at least a decade ago to make a 100 per cent recyclable cup by 2015 but has not yet followed through. In a statement to the Calgary Eyeopener, Starbucks Canada said its hot drink cup "actually is recyclable where supporting recycling infrastructure exists," and listed various other efforts its made, such as using 10 per cent post-consumer waste to make the cups and to give coffee drinkers a discount when they bring their own mug. Coffee cups: 3 months later, are they being recycled at Tim Hortons and Starbucks?